The first sportbike with real aerodynamic downforce? We'd like to see just how much downforce the front fairing and rear seat fairing with side wings generate in a windtunnel at high speed. Almost Ready for Production and Entry into 2009 World Superbike! Munich, Germay, April 16th, 2008 - BMW Motorcycles today confirmed in press releases their upcoming new 4-cylinder watercooled 1000c Superbike model the S 1000 RR confirmed for production in 2009. And that the release of the bike will coincide with a full factory BMW race team in SBK World Superbike beginnig immediately with the next 2009 race season. 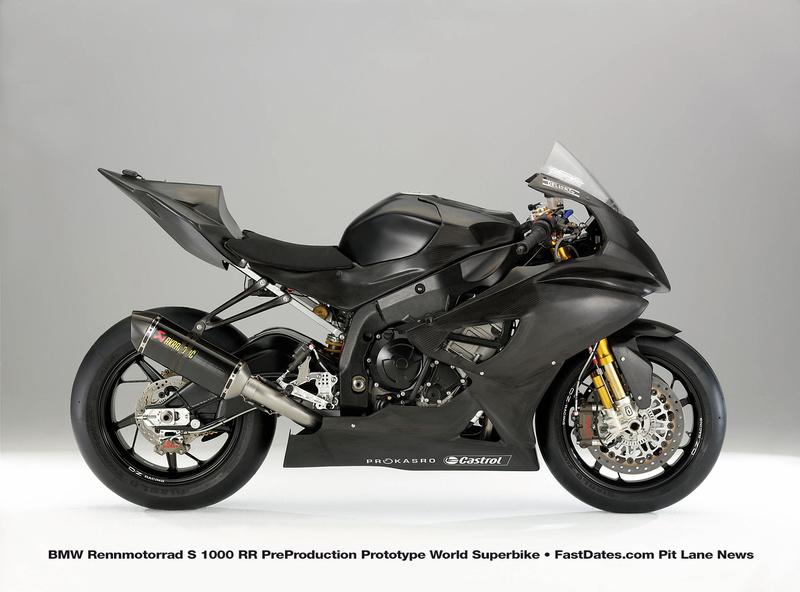 The first year's production will be 1,000 bikes to assue homologation for world superbike, with the cost of the high end sportbike costing in the rance of $20,000. 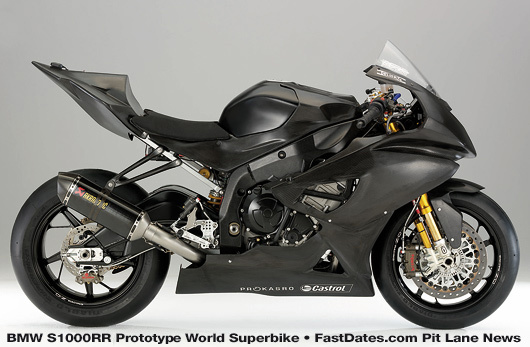 The production prototype is shown here, and it already looks like a race preapred factory superbike with its high-end race-spec piggy back Ohlins front forks and rear shock. 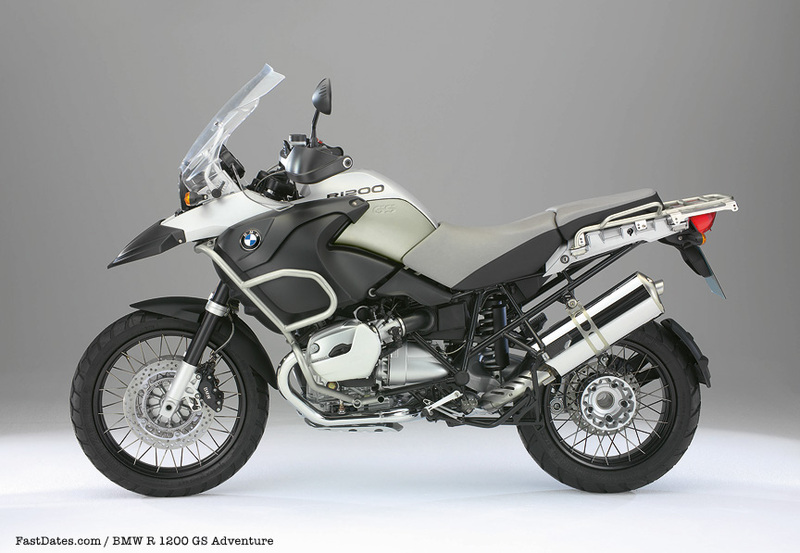 The right side view of the bike shows it has the front and real wheel sensing units of BMW's trademark anti-lock braking system which coud also serve as wheel monitors for a traction control system. The overall design of the bike is very conventional and similar to the current Japanese 1-litre superbikes, in particular to the Yamaha R1, with an aluminum perimeter frame hanging an inline watercoold doube overhead cam engine below it. The fuel tank looks to have a false cover over the front to make space for a pressurized high volume airbox. The bodywork of the prototype is all carbon fibre, which will probably be included on the production bike to support its up market positioning over its Japanese counterparts. World Superbike is going to be a real treat for race fans next year as BMW, which has proven it has the money, the resources and desire to win in the other upper echelons of motorsports racing from Formula One to World Sports Car Racing, is now setting its sights on motorcycle roadracing in World Superbike. We are guessing, with the right riders, BMW could be on top of the podium in its first race season, just as Ducati did its first yesr in MotoGP. 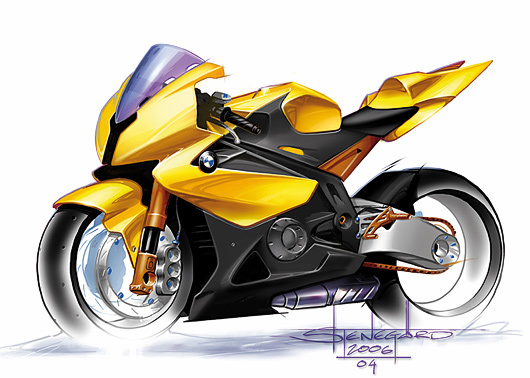 This early concept sketch of the BMW Superbike dated April 2006, shows just how quickly they were able to evolve the bike from concept to reality. The pre-production prototype ( shown below) when seen enlarged, shows the engine's cases and sidecovers to be all finished production parts. "We are expanding our product portfolio also with a view to worldwide growth. Today sales in the 1,000-cc class amount to some 100,000 units worldwide. The vast majority of these motorcycles goes to the USA and Europe. And the four large Japanese manufacturers account for about 85 per cent of the market. It is our objective to offer the customer a high-performance motorcycle with absolutely outstanding qualities and features on both the road and race track in terms of rideability, performance, and ergonomics. Since we are still in the middle of the development process, it would be too soon to mention any specific technical data. But you naturally know the usual level of performance our competitors have to offer. So with this in mind, I leave it to you today to speculate on what the specifications might be. As you may expect of BMW Motorrad, the design of our BMW Supersports will be absolutely unique and very different. While it will of course reflect the usual design language in the segment, it will at the same time offer a strong and powerful message from the BMW brand. " You'll see in the above enlarged closeup photo that the engine is built with smooth finished production molds, as opposed to rough prototype sand casting, so the bike is effectively past its prototype stage and ready for production. Any production delay now is esentially just to order and wait for outside suppliers to manufacturer and deliver all the necessary components like the Ohlins suspension, Brembo brakes, controls, electronics, wheels, etc., before manufacturting and assembly can begin at BMW. "Today I can confirm that our preparations are proceeding according to plan in every respect: In compliance with the rules of the Series, the new motorcycle will be available to customers in 2009 and we will build 1,000 production models by the end of next year. We are implementing our racing activities in close cooperation with our partner Alpha-Racing, a specialist very experienced in motorsport. Located near Munich, Alpha-Racing have already started work in a special production hall specifically for this purpose. The process of building up the team is proceeding at full swing and we have already filled the key positions. The team is a combination of specialists from BMW and members of the Alpha-Technik racing crew, as well as further specialists from professional Superbike racing. So much on this project, the current status of the project and our preparations for entering the World Superbike Championship next year. You have been speculating a lot on the designation of our new model. 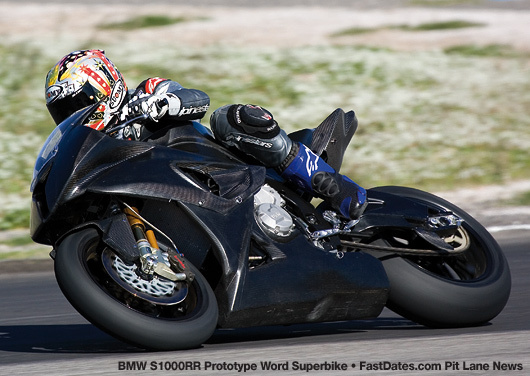 So let us put an end to this speculation today.BMW Motorrad’s first Supersports will be the “S 1000 RR”. Dear Motorcycle Friends, Many motorcycle magazines have published photos of a racing prototype which we have tested on several racing tracks. Today we would like to show you this racing prototype, offering you an initial impression of the package and the technology. But when you see the motorcycle, please note that neither the design nor the impression of quality are the same as on the production model following at a later point." Jan 5th, Berlin, DM - It wasn't susposed to go into production until the end of this year, but now we've got this picture of the new BMW S 1000RR Superbike which has just now entered production now, with delivery to begin in Europe in early summer (May - June). 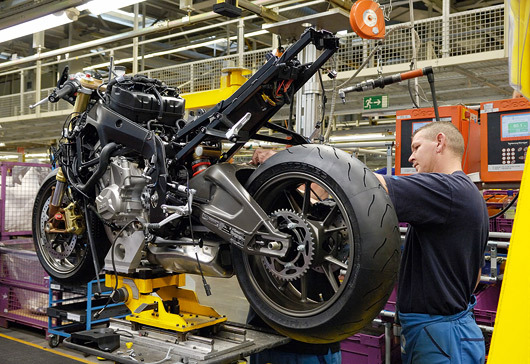 New bikes are rolling off the assembly line in Berlin as you read this. The bike is susposed to have a four-mode ABS/traction-control system. Traction control is apparently similar to the racebike's. Weight is a claimed 407 pounds dry, and expect around 160-180 rear-wheel hp from the compact 999cc in-line 4-cylisnder motor. Small, light Formula One-derived cam followers allow high rpm and high power output. 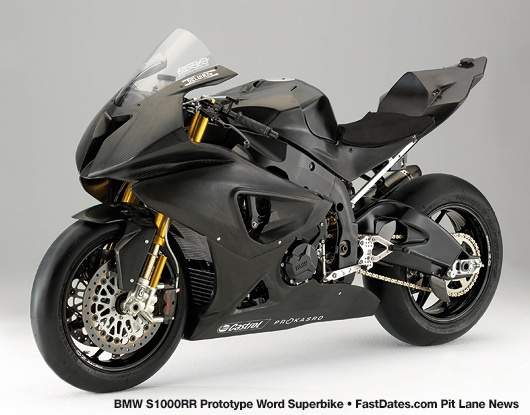 Another big suprise for the new BMW Superbike is the price. It won't be priced in HP2 territority, or up there with with Ducati and MV Agusta, but rather within $1000 of the Japanese competition. Can they do it? A look at the production bikes does reveal a few cost saving measures like the full-floater front brake rotors which appear to bolt directly to the front wheel without carriers, like a Ducati Multistrada. Both wheels also appear to be lightweight castings, rather than the forged race wheels find on the higher spec Italian bikes. Other components like the steel rear subframe also look fairly heavy. In current form this is a nice street bike, but not a competive weekend racer. We will have to wait for next year if a higher-spec track version is made available. The bike is available for pre-order in Europe right now for early-summer delivery. The USA pricing nor a press kit haven't been released yet, but in Germany the bike will retail for 15,150 Euros. That's about $19,700, but that price includes the 19% German sales tax. By comparison, the 2009 Yamaha YZF R-1 sells for 14,895 Euros in that same market. 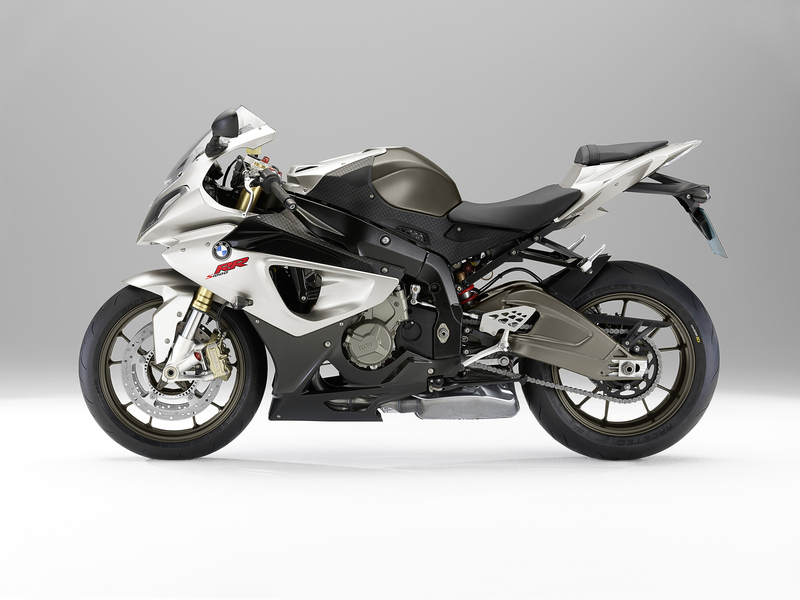 So the new Beemer Superbike in Germany is priced within $400 of thr Yamaha. Add in shipping to the USA and the price difference could increase to perhaps $1,000 more, although the US Dollar is becoming stronger under current economic conditions.